OurEnergyPolicy.org | What’s in Line for Keystone XL? 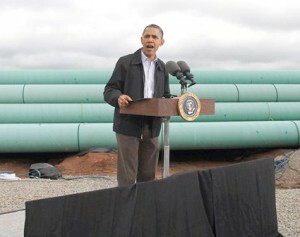 What’s in Line for Keystone XL? Last week Governor Dave Heineman of Nebraska approved the Keystone XL pipeline along a revised route, “which avoids the environmentally-sensitive Sand Hills region of Nebraska.” The final decision now rests in the hands of President Obama, who last year rejected the previous route on grounds that construction of the pipeline and the possibility of a spill could contaminate the Ogallala Aquifer in the Sand Hills region. President Obama has many people wondering whether his Inaugural Address, in which he reaffirmed a commitment to fighting climate change, may foreshadow his decision on the Keystone XL pipeline. However, the State Department has further delayed a final decision until after March. In light of the revised pipeline route, should the Keystone XL project be approved? Is there anything missing from the dialogue surrounding the Keystone XL pipeline? 4 Responses to What’s in Line for Keystone XL? If those of environmental concern really want to stop KXL, they need to protest in Canada – because China is ready to get some of that ‘dirty tar sands oil’, one way or the other, if the US doesn’t want to go through with the infrastructure. It appears, at least on some level, that the Nebraska / Aquifer issue is ‘addressed’, so far as Nebraska gave it the OK. So that takes away some thunder from the local/regional concern. I can only see this as one step closer to KXL’s eventual completion. The dominant policy issue related to the Keystone XL pipeline is that while Alberta oil sands production provides a secure source of oil supply for U.S. and world oil markets, producing this higher greenhouse-gas emitting resource on a massive scale will encourage continued growth of world oil consumption and worsen the global warming problem . As I wrote a year ago on this topic when the pipeline was first being considered, this is the far bigger question than the route of the proposed pipeline because ways will eventually be found to transport the oil to markets worldwide. The United States and countries around the world need to begin the process of reducing oil consumption and migrate to clean, efficient alternatives to oil-based transportation to prevent the huge costs of global climate change. Instead of moving in the direction of adding oil sands pipeline infrastructure, the U.S should be developing a clean-energy infrastructure strategy. This includes electric vehicles powered by a smart grid using clean renewable energy, natural-gas vehicles, and new service station infrastructure to fuel the next generation of vehicles. The Keystone XL pipeline is not just a pipeline issue, it is a keystone decision about the future direction of U.S. energy policy. The Obama administration needs to lead the US and world in beginning to solve the global warming problem for current and future generations. The decision to delay a decision on coming down on January 18, climate change getting a starring role in the President’s inaugural speech and then the confirmation of John Kerry, bringing some real climate change understanding and passion to the State Department combine to look like the potential for winning platform for opponents of the Keystone XL pipeline. With that said, my expectation is that project is approved (albeit not until much later this year at the earliest – Timothy Gardner writing for Reuters has sources saying no chance of a decision before summertime at the earliest). Jesse’s point is a good one – the oil (and its emissions) are coming out of Canada one way or another – as Andy Holland points out oil is like water, put a dam in its way it still want flows downhill to the markets – and this fact alone is probably enough to ultimately push the project through. Add what looks like fairly solid bipartisan support in Congress (last week Sen. Hoeven (R, ND) claimed to have collected 53 supporting Senators’ signatures in one day), Obama being fairly non-committal on the subject at this point and the path to stopping the pipeline looks impossible. What is more interesting (to my thinking at any rate) is what this fight means for the climate movement. The Keystone fight is absolutely raising awareness, and specifically awareness that we are reaching (have reached?) the inflection point on emissions relating to the 14 huge fossil fuel projects and the ability to restrict global carbon emission to less than the 450ppm in order to have a chance at the necessary 2C temperature increase limits of global warming. What is less clear is whether that awareness will translate into broad support for real action or whether it risks acting as a distraction for an inevitable project.